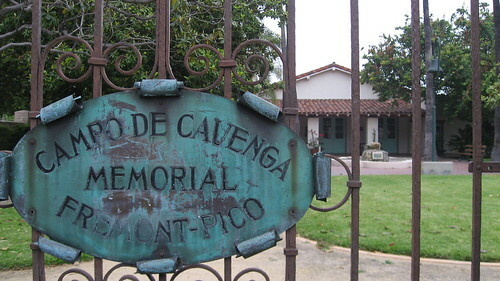 Campo de Cahuenga marks the site where the Treaty of Cahuenga was signed on January 13, 1847, effectively marking the end of the U.S.-Mexican War and turning over Alta California to the United States. (The formal ending came with the Treaty of Guadalupe Hidalgo the following year.) Leading the signers to the 1847 agreement were U.S Lieutenant Colonel John Fremont and Mexican General Andres Pico. Another El Camino Real Bell. 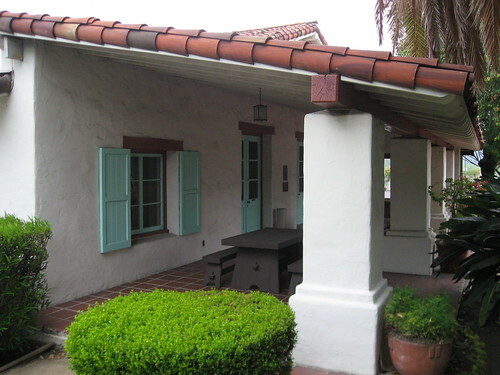 The original adobe farmhouse in which the treaty was signed deteriorated and was torn down more than a century ago. 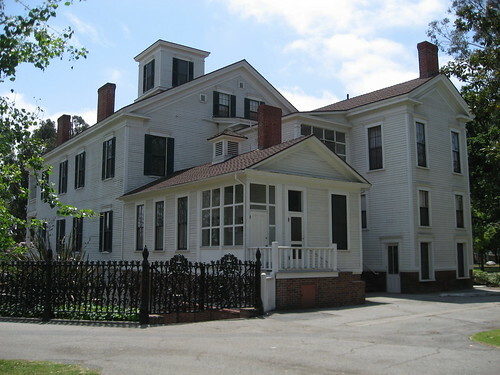 That building was built probably between 1785 and 1810. 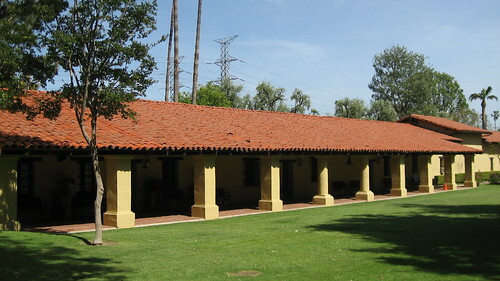 The city bought the site in the 1920s and built another adobe there, dedicating it in 1950. The front of this current building mirrors the original’s. Flash forward to the mid-1990s as the Metro Rail Red Line subway was being dug there on Lankershim Boulevard. 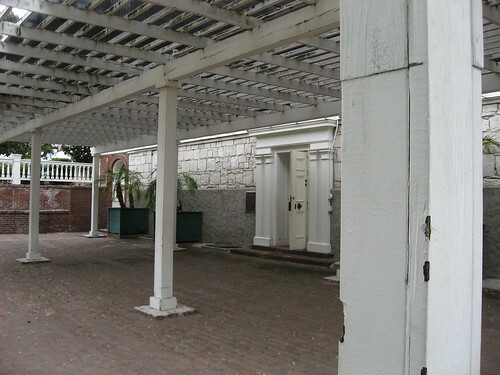 Workers uncovered the original house’s foundation and floor tiles, some of which have been preserved and are on display. Unfortunately, Campo de Cahuenga’s open just a few hours a week – only on Saturdays. But that’s when it is open. Which it’s not, now. I’m told the site will be open again “toward the end of the year”. So no look inside at the museum part, for now. Until the re-opening, you can look through the gate bars at the new building. 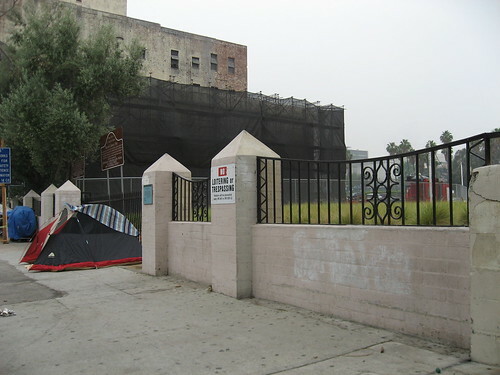 On Lankershim, you can see the fancy paving and brickwork denoting the location of the original building, which measured about ten by forty feet. You might be driving over it every day and not even know it. 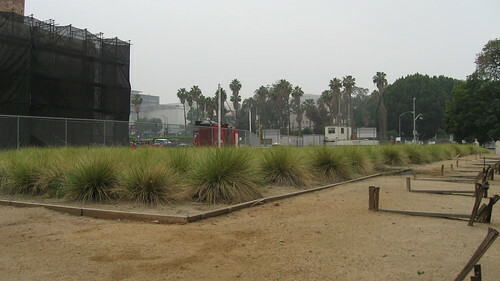 The outline of the original adobe on Lankershim Boulevard. 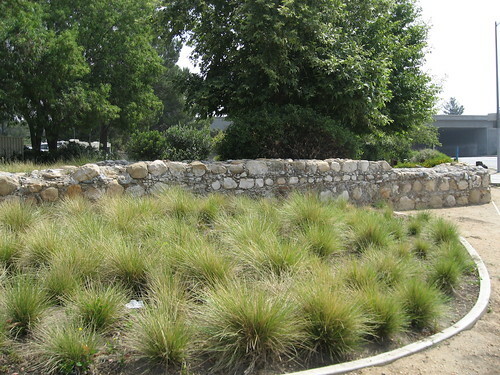 Here’s the official webpage for Campo de Cahuenga. 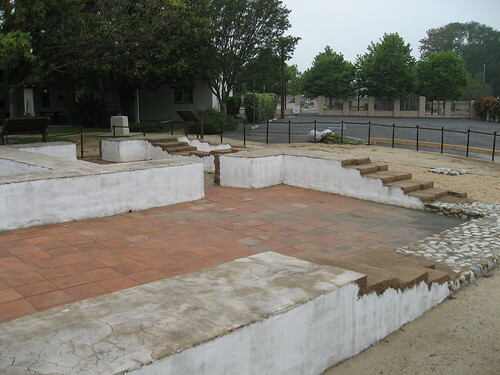 The site’s also on the National Register of Historic Places, and is designated California Historical Landmark No. 151. Where are those L.A. blue skies? Oh, man. You might want to skip this post. It’s really disappointing. William Andrews Clark, Jr, made his money through inheritance (copper mining in Montana) and the stock market. He had Robert D. Farquhar (who also designed HCMs No. 43, downtown’s California Club, and No. 391, the Canfield-Moreno Estate, as well as Beverly Hills High School) create this French Renaissance Revival building to house his rare books and manuscripts collections, which emphasized 17th- and 18th-century English literature and history, Oscar Wilde, and fine printing. 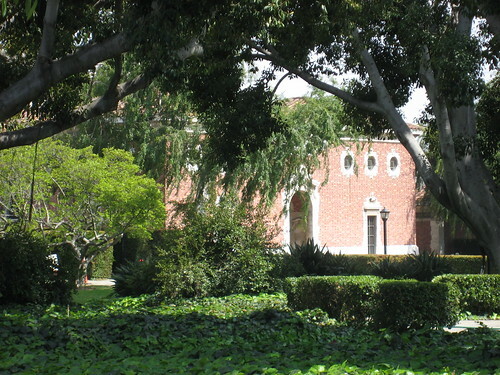 Upon his death in 1934, Clark left the building and his collections to UCLA in memory of his astronomically wealthy dad, a Montana senator who died in 1925. Clark, Jr’s house, which was also on the West Adams grounds and pre-dated the library, has been demolished. William Andrews Clark, Jr, founded the Los Angeles Philharmonic Orchestra at the end of World War I and bled money into the organization while he was alive. So the disappointing part is the library’s undergoing some interior renovations. I first tried to schedule a tour, available only during weekdays. When that didn’t work out, I decided just to pop by for a few quick photos. However, when I got to the north entrance, a security guard prevented me from going too far inside the compound. Or, rather, from going inside the compound at all. 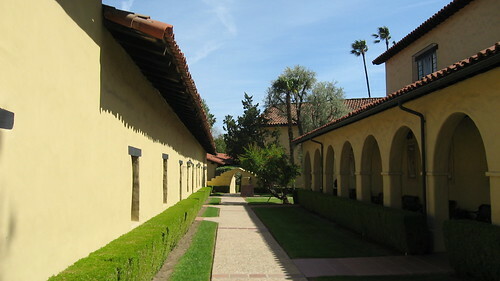 Further, the grounds – which take up the whole block – are surrounded by a very tall wall, preventing any glimpse inside. 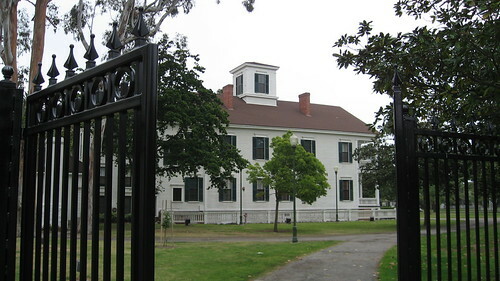 The Castle, built around 1882 on Bunker Hill, was moved to Heritage Square in 1969 to be restored as part of the site’s collection of Victorian architecture. Unfortunately, the building was burned to the ground by arsonists on October 9, 1969, the same night as the Salt Box. A shot of the Castle being dismantled for relocation. Here’s a picture of the Castle and Salt Box being moved. 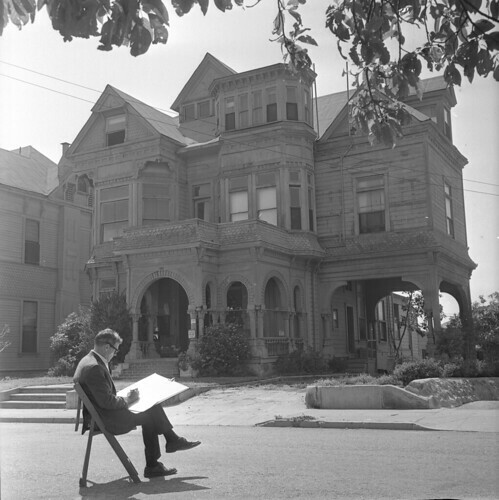 The artist in the above photo (from UCLA’s Digital Collections) is Mr Leo Politi. 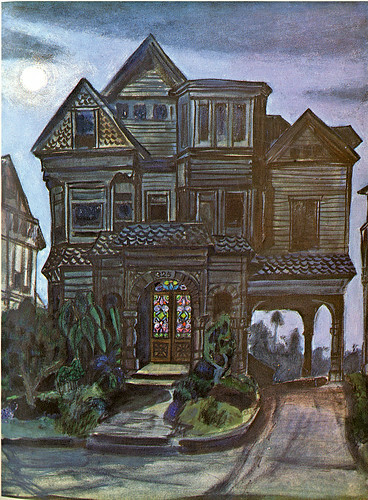 Politi (1908 – 1996) was a children’s book author/illustrator with a passionate dedication to the city of Los Angeles. Some of his more L.A.-centric books include Pedro, The Angel of Olive Street (1946), and 1989’s Angeleno Heights. He was also responsible for a few murals downtown, most notably the Blessing of the Animals at the entrance to the Eugene Biscailuz Building on Olvera Street. 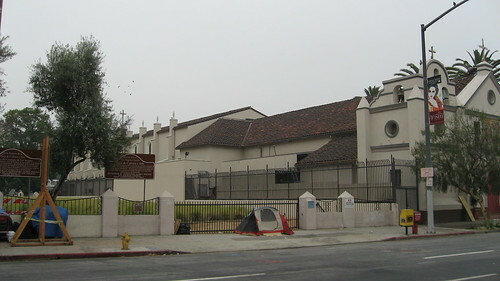 Today, there’s a Leo Politi Elementary School, dedicated in 1991, on West Eleventh Street, and a Montecillo de Leo Politi Park in Elysian Park. 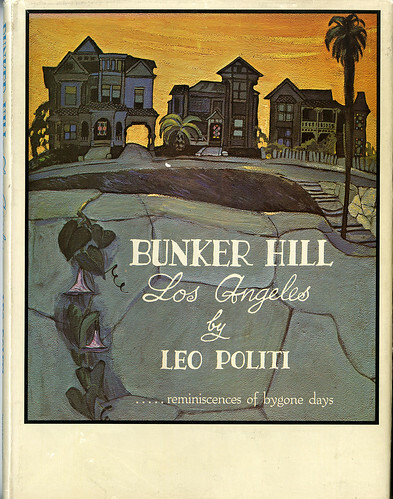 Here’s the cover to the 1964 book, Bunker Hill, Los Angeles, which features Politi's artwork of the once exclusive, upper-class area, painted during the Hill’s last, sad days (that’s the Castle in the upper left). The book, originally published by Desert-Southwest, Inc., has long been out of print. 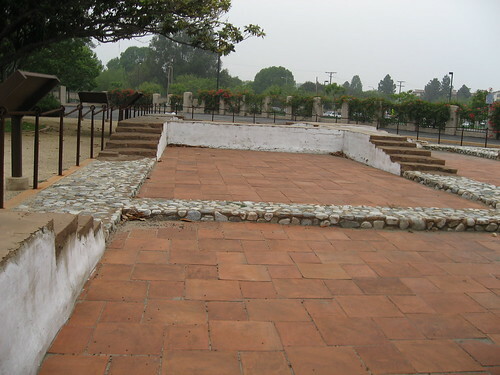 If you were Catholic and died in the pueblo of Los Angeles prior to 1820 or so, you were probably buried at the San Gabriel Mission, home to the only Church-consecrated ground back then. With the Plaza Church on the right. 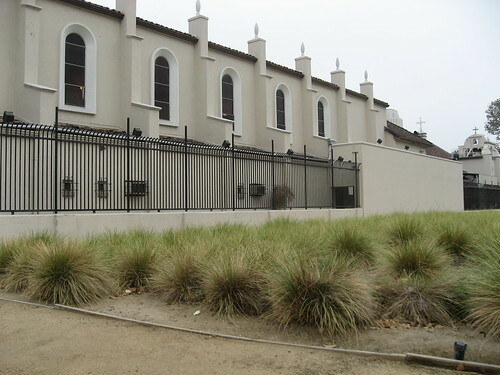 Then, with the building of Iglesia Nuestra Señora Reina de los Angeles, or Plaza Church, on Main Street, folks began to be buried on a plot just south of the new church (actually, according to San Gabriel records, they were buried there as early as 1820, two years before Plaza Church went up). Between 1826 and 1844, about 650 people were interred in the cemetery, according to the church burial register. Does anyone know when the cemetery was paved over for a parking lot? Does anyone know when it was unpaved to its current condition? Does anyone really know what time it is? Does anyone really care? The black and white photo above, probably from the mid-1980s, is from L.A.'s Department of City Planning website. There is still some conjecture as to whether all the bodies were exhumed from the cemetery back in the 19th century. This means that those folks who eventually work in the 1883 Plaza House building next door (currently being converted into a center for Mexican-American history, genealogy, and culture), covered in black in the shots above, could literally be working on top of an old Indian burial ground. Taken from the back of the cemetery. 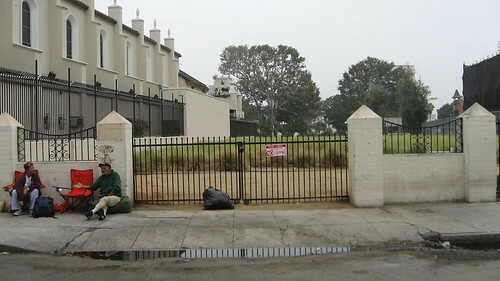 For what it’s worth, the first public cemetery in Los Angeles was on Fort Moore Hill. 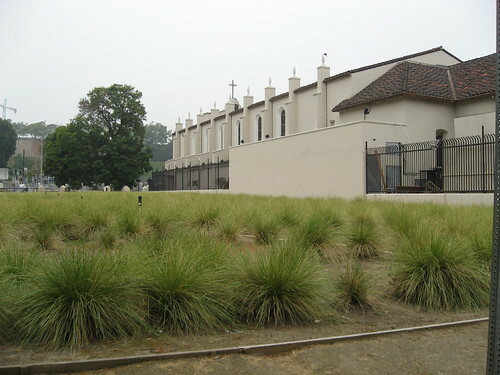 The back entrance of the cemetery. Donna and Troy here told me there was a $25 per picture fee for taking shots of the cemetery. I was skeptical, but I really wanted that shot. 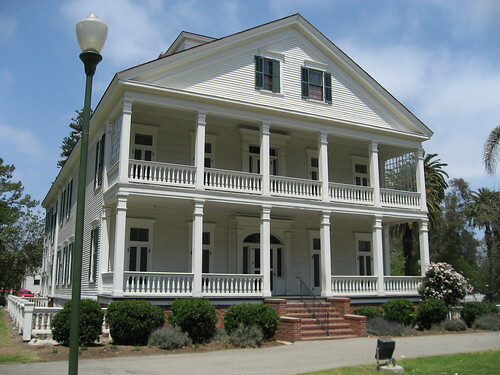 Folks say they can’t imagine a better example of Greek Revival architecture in Southern California, and I can’t imagine a Los Angeles building built in 1864 in this good of shape. Phineas Banning was a Delaware boy, born in 1830. After a few years at his brother’s law office and some dockworking in Philadelphia, he went west at the age of 21. (Well, not straight west. He first sailed to Panama, then cut across the Isthmus, and finally took a boat up to San Pedro). The enterprising Banning made his first fortune in the staging and freighting business. In 1857, he bought some land above San Pedro, creating a landing and monopolizing the business in the harbor. The next year he and his partners founded New San Pedro on 640 acres. 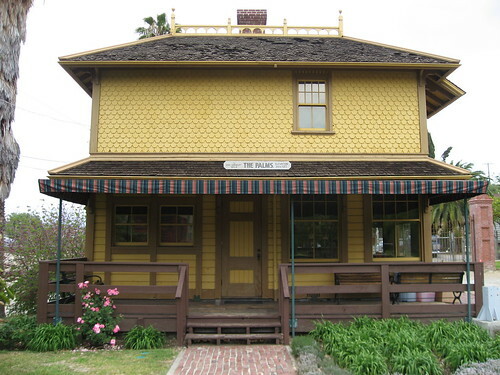 In the early 1860s, Banning was the sub-contractor in setting up the first telegraph line between the town and L.A. He renamed New San Pedro in 1863 after his hometown in Delaware – Wilmington. During the Civil War, Banning, a rabid abolitionist, and a business partner sold a chunk of land to the Union Army getting $1 a piece. (The pair later were returned the land, buying a bunch of Camp Drum’s buildings in the process.) Banning was then commissioned with the honorary title of General in the California State Brigade of the National Guard. At the end of the war, he was appointed president of the Pioneer Oil Company. He then served as California State Senator from 1865 – 1868, during which tenure he took part in California’s ratification of the 13th Amendment. There used to a fountain here in front of this below-ground-level door. Coaches would pull up (down?) here dropping off and picking up guests. 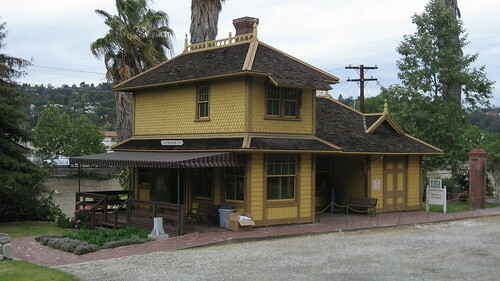 Banning played the good guy in giving up the Los Angeles and San Pedro Railroad – not only the first railroad in Southern California (given the go-ahead in 1868) but also a vital (and lucrative) 21-mile link between L.A. and Banning's Landing – to the Southern-Pacific Railroad. Without that link, the SP would’ve bypassed L.A. in favor of San Bernardino. You can see where the original home ends and where the later additions start. Phineas Banning spearheaded the charge to get the government to fund the 1871 dredging of San Pedro Bay, then building a breakwater (closing the gap between what were then known as Rattlesnake and Dead Man’s Islands) in making the Port of Los Angeles. The stagecoach barn, part of the tour except when I'm there. In 1885, the indefatigable Banning, “The Father of Los Angeles Harbor”, ultimately proved very fatigable, dying in March from results of being hit by a San Francisco streetcar the previous summer. His sons, William, Joseph, and Hancock, bought Catalina Island in the early 1890s, owning it until World War I. The site's first structure, the pumphouse. The land was extra soggy, so besides this, there were tons of eucalyptus trees planted to soak up the groundwater. Oh. The Landmark. 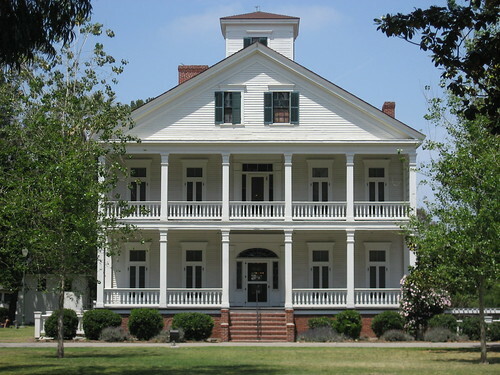 Built during the Civil War, the residence stayed in the Banning family until 1927, when the city bought it along with the surrounding twenty acres. Tours are now offered of the site, which is now a museum. The drag is that when I was there, our group got a walk-through of the house only. I found out later that the park’s one-room schoolhouse and stagecoach barn should’ve been included on the tour. But they weren’t. If you go, make sure you get a look at them. 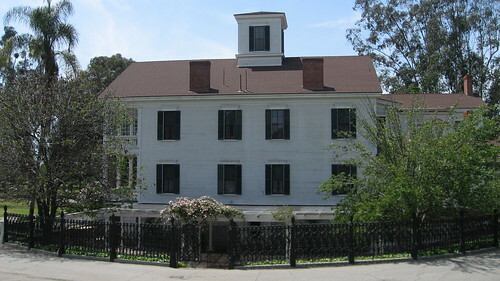 The Banning Residence is also a California landmark and is on the National Register of Historic Places. In its estimated 1,000-year lifespan, this giant oak tree grew to more than seven stories tall with a trunk twenty-four feet in diameter and a 150-foot canopy. So the tree survived a whole millennium, making it through every natural disaster known to Southern California (and there are a lot of them). Even developers in the 1950s, a 1980s car crash, and a bacterial infection couldn’t do it in. Unfortunately, a giant El Niño rainstorm on February 7, 1998, could (do it in, that is). Uprooted it was, smashing a couple of cars in the process. If you go to the site, you can see a big hunk of the Lang Oak on display. Not only does it provide an inspiring reminder of the millennium the mighty oak stood rooted where it had since a century before the Norman Conquest, but is also provides a convenient nook to stash your empty iced tea and beer bottles. See Will Campbell’s webpage for some seriously dedicated Lang Oak coverage. One more thing. 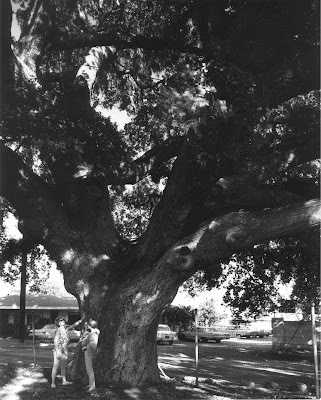 The Lang Oak has been the only HCM to be designated in Encino. 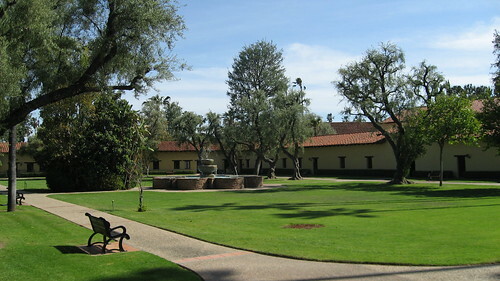 But just down the street is Los Encinos State Historic Park, which is a state landmark and is listed on the National Register of Historic Places. Anyone know why it hasn’t made city monument status, yet? 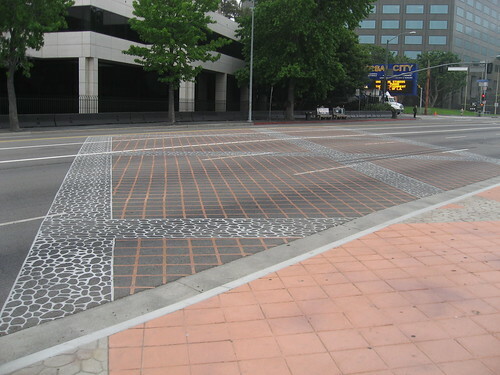 The black and white photo is from Los Angeles's Department of City Planning website. 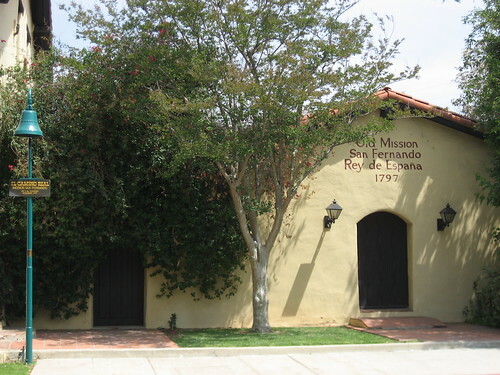 The San Fernando Mission – the seventeenth in the chain of the twenty-one Alta California missions – was established on September 8, 1797 by Padre Fermin Francisco de Lasuén. It’s too bad that nearly none of that original mission survives today. 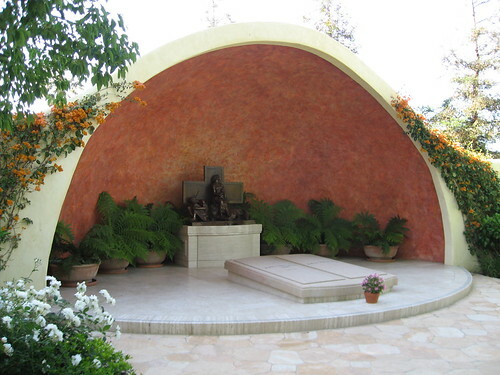 What is there is the mission museum and archives, a church, a seminary, a cemetery, the headquarters of the archdiocese, and several gardens, including the Bob Hope Memorial Garden. But none of it original. I counted three El Camino Real bells on the site. 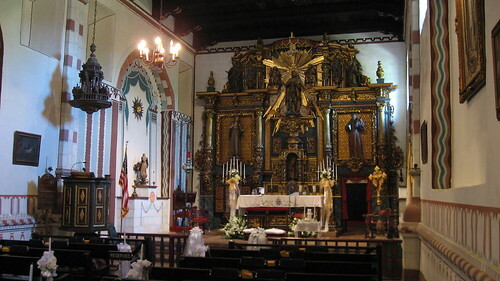 Named after 13th century King St Ferdinand, the mission was very prosperous in its first twenty years or so. Unfortunately, the results of increased demands on the mission, the thinning of the local Indian population (a primary source of cheap labor, there were 1,000 Indians there in 1804), and a huge earthquake in 1812 took their toll. The string of missions was secularized in 1822 after Mexico gained independence from Spain. 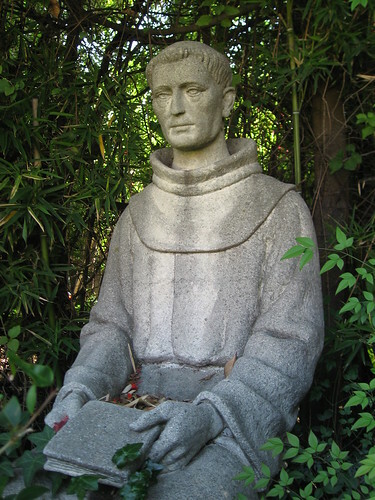 Father Ibarra, who had been running the mission and had always stayed loyal to Spain, finally left in 1835. In the early 1840s a decades long digfest at the property began beginning with the church floor being dug up by prospectors when gold was discovered nearby. 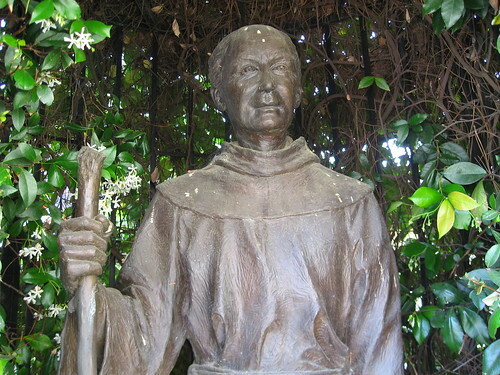 Blessed Junipero Serra, founder of the California missions. 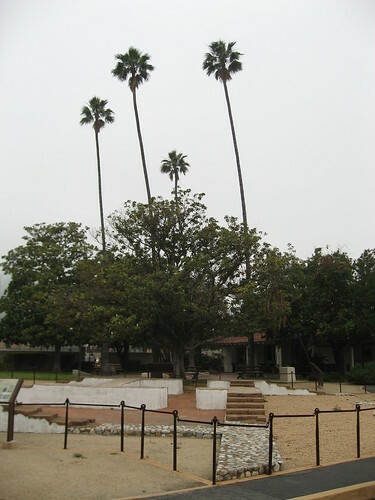 In 1845 Governor Pio Pico leased the mission lands to his brother Andres who used it as a summer home for a couple of years. Not too long after that the land was sold again. Then things went downhill fast. By mid-1890s, the property had seen life as a warehouse, a stagecoach stop, a stable, and even a hog farm. 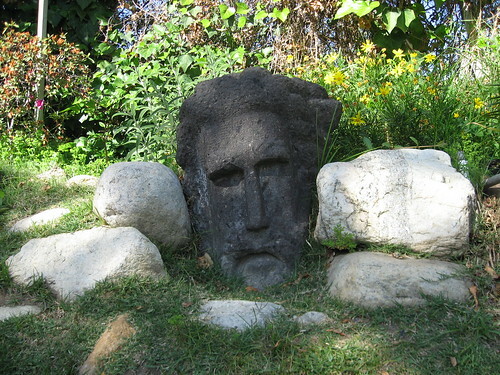 Things looked brighter when, in 1896, Charles Fletcher Lummis, founder of the Landmarks Club, began a campaign to take back the mission property. 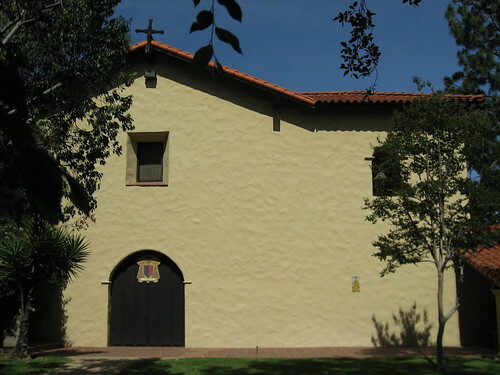 In 1923, the Church once again returned to the mission and the property was turned back into a working church. 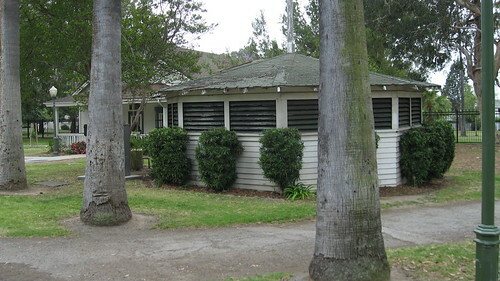 The Sylmar earthquake in 1971 pretty much wiped out what was left of the original buildings. A replica of the previous church (but not of the original one), the current church opened in 1974. The interior of the 1974 church with a 16th century gold-leafed reredos. Pope John Paul II visited here in 1987. The mission highlight, at least for me, is the convento. It took thirteen years to build and was finished in 1822. 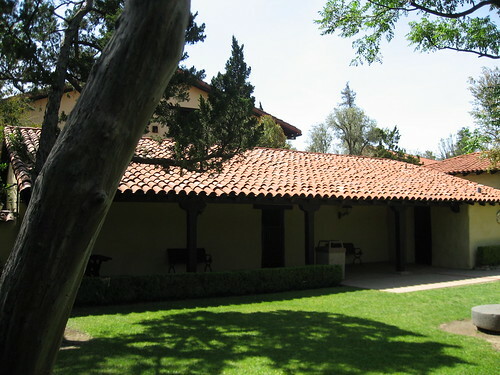 Later enlarged to two stories, it used to be the largest adobe structure in California. 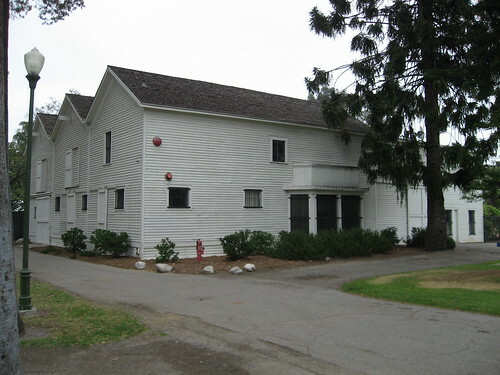 The building was also used by Colonel John C. Fremont when the Army invaded California in 1847. Today, the convento contains more of its original components than any other structure there, and its restoration looks great and is as authentic as can be. After touring the mission’s museum, church, workshops, and grounds, it’s hard not to feel a little churchy by the time you leave. 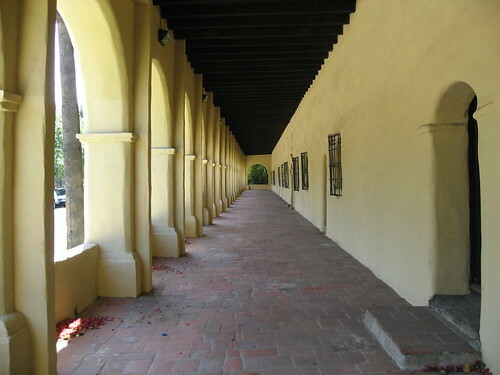 Mission San Fernando Rey de España is a California Historical Landmark and is also listed on the National Register of Historic Places. 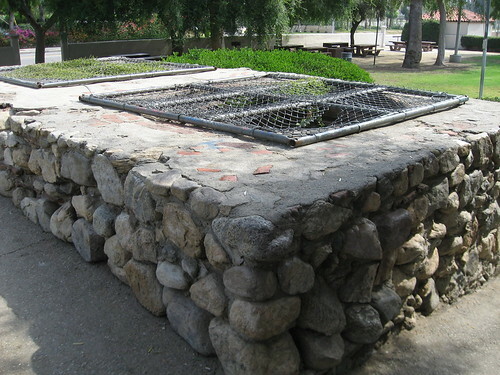 The mission's original tallow pits/soap works in Brand Park. 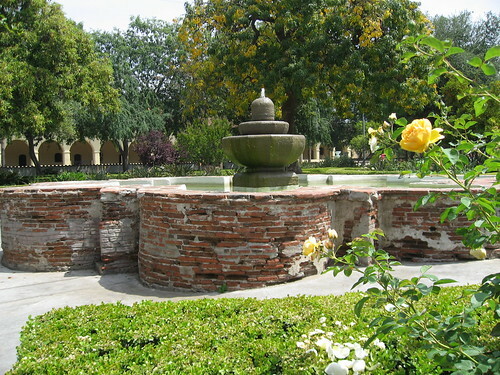 Also across the street in Brand Park, the mission garden's fountain (1812-1814), moved 300 feet from its original site in 1922. 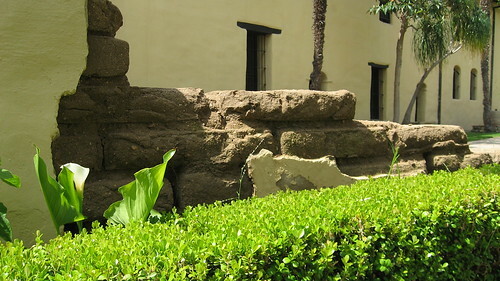 A few blocks away, you can see the remains of the mission's 1808 dam. 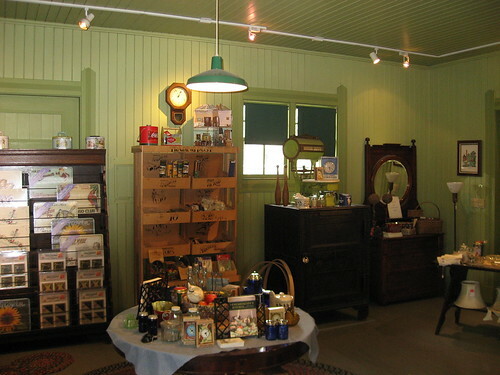 Have you been to Heritage Square Museum? Heritage Square Museum isn’t a museum like you’d think. It’s really a collection of Victorian buildings – a railroad depot, a church, a carriage barn, and a couple of homes (and one boxcar) – moved to the ten-acre site starting in 1969 as each was threatened with demolition. 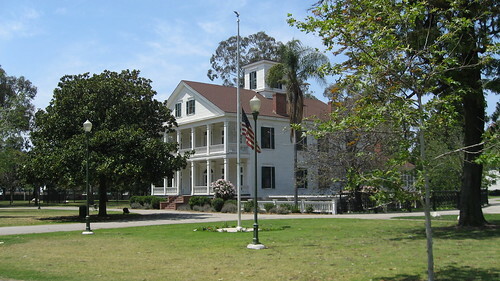 You may’ve seen Heritage Square as you’ve driven by it on the Pasadena Freeway just northeast of downtown. 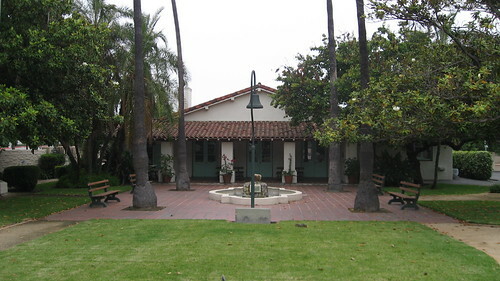 There are seven Los Angeles Historic-Cultural Monuments on the property. The first on the declaration list is No. 22, the Palms-Southern Pacific Railroad Depot. 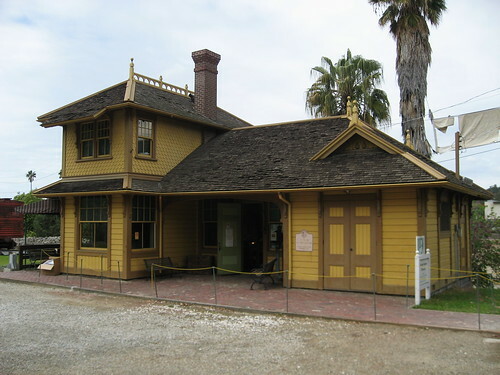 Known informally as “The Grasshopper Stop” when it was built by the Southern-Pacific in 1886, the Eastlake-style depot was soon renamed “the Palms” and served as a stop between the city of Los Angeles and the Pacific Ocean. 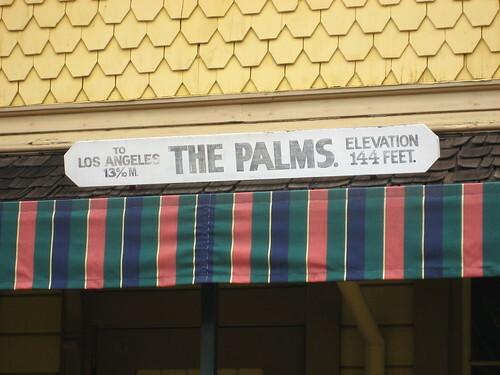 According to an on-site docent, it was put up at a time when the Palms area consisted of just four homes. It served as a fairly popular stop in the 1930s and 40s what with MGM being in Culver City and all, but the depot was pretty much abandoned when the Red Car line shut down in 1953. The Boy Scouts used the building throughout the 1960s and even for a year after Globe Department Stores bought the building in 1971. It was then vacant, then condemned, sitting alone behind a furniture store on National Boulevard off Vinton Avenue. The Cultural Heritage foundation took possession of the old depot in February, 1976, for $1. 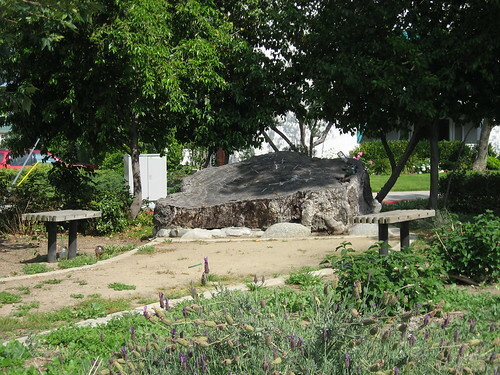 It was moved to Heritage Square later that year and is now fully restored. 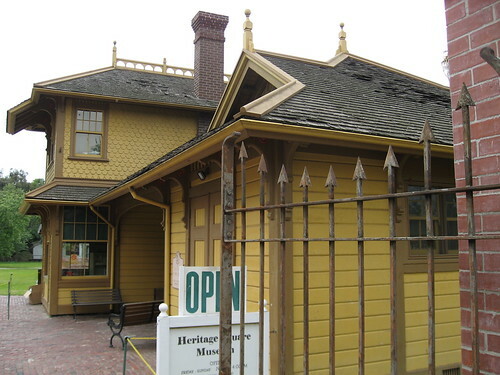 The Depot is the first building you hit when you walk in Heritage Square. It serves as the park’s visitor’s center and store. 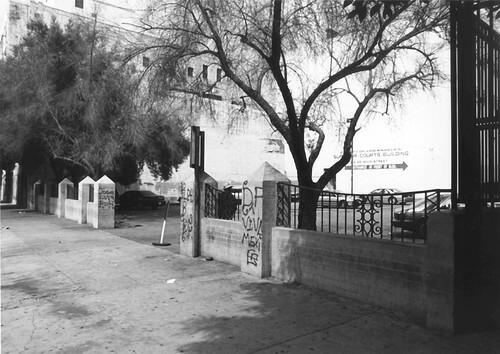 The shot below is from early 1976, with the depot in its original Palms site. 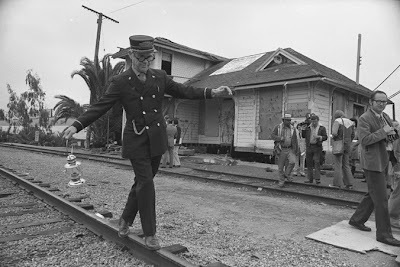 The balancer is Disney animator and rail aficionado Ward Kimball, who was then a member of the Railway and Locomotive Historical Society. Photo by Bruce Cox, from the UCLA Library Digital Collections website. 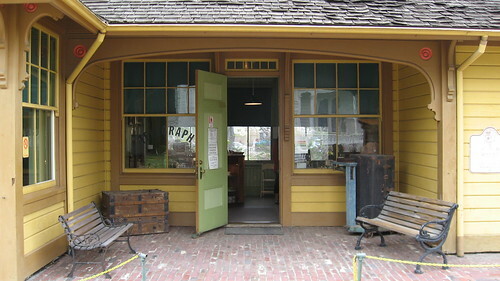 As with all of the buildings in Heritage Square Museum, inside photography is forbidden. I’m not sure why that’s the case with all of these buildings, and I’m not sure if the folks at Heritage Square know, either. I’d think you’d want as many photos as possible drawing attention to all the restoration work needed on a few of the buildings’ interiors. In any event, I got one shot of the inside of the Palms Depot. Hey! 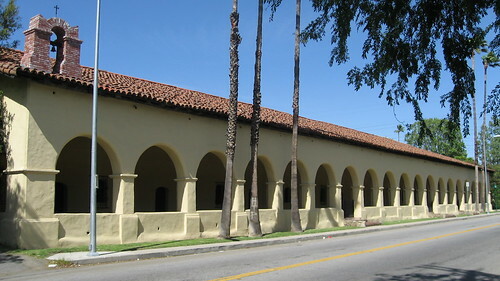 The Palms Depot was used in a few films, including a couple of Hal Roach comedies. 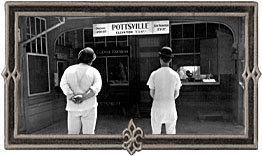 The inside of the depot, the visitor’s center, had a few great framed pictures of Laurel and Hardy sitting outside the building in the 1929 short “Berth Marks”. If any of you Sons of the Desert members out there have copies of the stills, send ‘em in. Here’s one tiny one I found at the boys’ official website.